Akbar Ganji is in prison for having expressed publicly his opinion for democratic reforms and having denounced state crimes. He has been tortured and ill-treated. Since 2000 he has been charged with "undermining national security and propaganda against institutions of the Islamic State. His supporters fear for his life. Arnold Tsunga represents victims of human rights abuses and campaigns for greater respect for human rights; he has repeatedly denounced the undemocratic system of justice in Zimbabwe. He has been threatened, detained, and is constantly harassed. Golden Misabiko has denounced human rights violations in his country for the past 20 years. 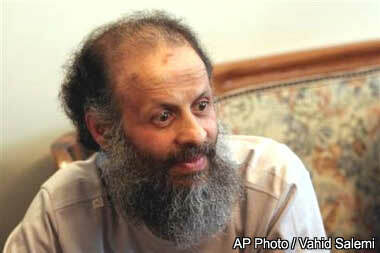 He was tortured in 2001 and had to flee the country in 2002 due to death threats. He returned to the DRC in 2005. Since then he has been detained several times and constantly harassed. Jennifer Williams, one of the leaders of WOZA (Women of Zimbabwe Arise), continues to organise and lead peaceful protests against the ongoing erosion of human rights in Zimbabwe, in spite of having been arrested and beaten by the police. In 2005, the jury decided to start publicly announcing the leading candidates as they are all in an urgent need of protection. The four candidates were carefully selected by the ten human rights organisations that constitute the jury. On 23 May, the jury will announce the final MEA laureate at a conference in the Carter Centre in Atlanta, USA. The jury is composed of the following organizations: Amnesty International, Human Rights Watch, Human Rights First, International Federation for Human Rights, World Organization Against Torture, International Commission of Jurists, German Diakonie, International Service for Human Rights, International Alert, HURIDOCS. The MEA, created in 1993, is granted annually to an individual or an organization who has displayed exceptional courage in combating human rights violations. The previous laureates are: Aktham Naisse, Syria (2005); Lida Yusupova, Russia (2004); Alirio Uribe Muñoz, Colombia (2003); Jacqueline Moudeina, Chad (2002); Peace Brigades International (2001); Immaculée Birhaheka, DR Congo (2000); Natasa Kandic, Yugoslavia (1999); Eyad El Sarraj, Palestine (1998); Samuel Ruiz García, Mexico (1997); Clement Nwankwo, Nigeria (1996); Asma Jahangir, Pakistan (1995); Harry Wu, China (1994). Martin Ennals (1927-1991) was an influential figure in the modern human rights movement. He was the first Secretary-General of Amnesty International and the driving force behind many other organisations. His deep desire was to see more cooperation and solidarity among NGOs. or visit our website - http://www.martinennalsaward.org/ for other documents and pictures of nominees.